Add a new pet to your yard or landscaping with this Athens Weathered Stone Small Sausage Dog Statue. A raised head, forward gaze, and curled tail on this piece form a realistic dachshund shape, perfectly showcasing your favorite dog breed. The canine sits on all four legs, slightly reclining as if awaiting a petting session. Lighter brown hints beneath the aged gray and brown body of the pup lend a natural look to the item, and texture in the concrete construction adds dimension. This piece rests easily on a level surface, bringing a fun look to your garden through the warm months. Showcase the unit indoors during the winter for longevity, or use it in your entryway year round as a jovial sentry. 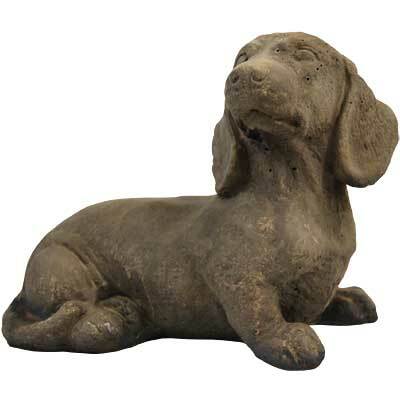 Allow a delightful dog figure to welcome visitors to your home or yard using this Weathered Stone Small Sausage Dog Statue.